Now 48 hours removed from a season-ending 4-1 loss at the hands of the defending national champion Minnesota-Duluth Bulldogs in the Frozen Four semifinals at KeyBank Center, however, and perhaps it’s a bit more clear just what an accomplishment getting that far at all truly was. Ironically, the loss came four years to the day after Providence won its first national title, a dramatic win over Boston University that is perhaps best remembered for Matt O’Connor’s gaffe in the Terriers net and Jack Eichel being robbed of his only chance to win a national title than it is anything Providence did. Since then, though, it’s been a slow, but steady, climb to try to get back to the top of the mountain. In 2016, there was the first-round exit at the hands of those very same Bulldogs. Two tournaments ago, it was a shutout loss to Harvard in the opener. Last year, however, Providence made it to the regional final, only to lose to Notre Dame in a one-goal game. 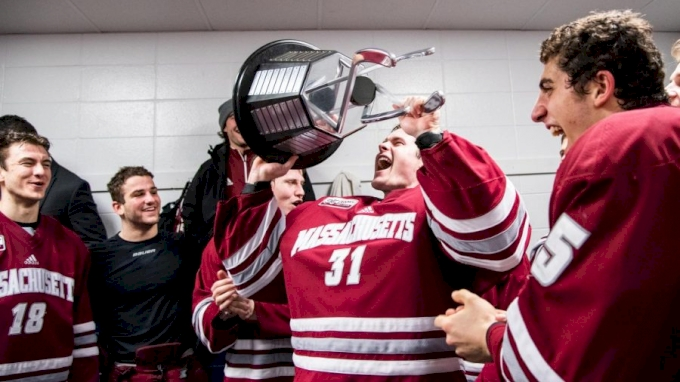 So, tough as the result was, getting back to the Frozen Four represented some serious progress for a Hockey East powerhouse program that was more than worth the cost of a FloHockey subscription this postseason. “It just shows how special Providence as a program is to make it the three years that Kasper [Bjorkqvist] and I were [there], made it to the tournament every year,” junior Friars defenseman Jacob Bryson said. The Friars have made it to the NCAAs in each of the last six years under Leaman, and have posted no fewer than 22 wins in any given season during that stretch, both incredible accomplishments. Beyond that, those groups also set the stage for future success, with the departing seniors, most notably goaltender Hayden Hawkey, very much so included. “I learned a lot from the older guys, like how to carry myself, how they go to the rink every day,” freshman Tyce Thompson said. Not quite as special as they all may have hoped, but the foundation has slowly, but surely been set for that to change going forward. “I thought if we won tonight, we were going to win a national championship,” Leaman said on Thursday night.